Emerald Ash Borer (EAB) has been found in Durham and Orange Counties, in addition to eight other counties in North Carolina. 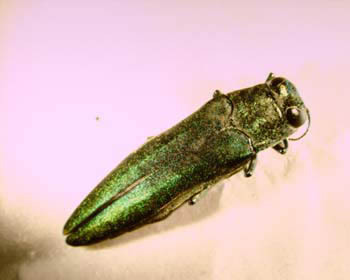 EAB is a metallic green beetle that bores into ash trees feeding on tissues beneath the bark, ultimately killing the tree. As of July 2015, Durham, Franklin, Graham, Granville, Johnston, Orange, Person, Vance, Wake, Warren, and Wilson counties are under the EAB quarantine. This means that any part of an ash tree, the insect itself, and all hardwood (deciduous) firewood cannot be moved from a quarantined area into an area outside the quarantine. If you observe a dying ash tree and suspect the emerald ash borer, please report the location and descriptions of potentially infested trees to 1-800-206-9333 or newpest@ncagr.gov or you can contact your local forest ranger. Links to many photos of the Emerald Ash Borer and its effects can be found here.